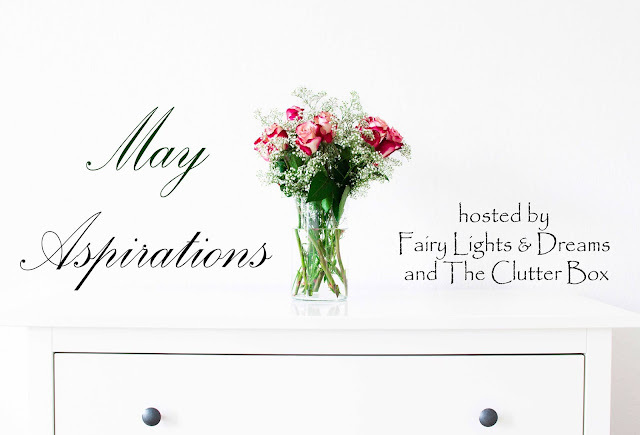 Welcome to our 5th month of the Aspirations Link-up! For those of you who are new around here. Angela from The Clutter Box Blog and I each take turns co-hosting the link-up. It's a place to share what you aspire to accomplish each month. We created this link-up in hopes to create a community that encourages, supports, and motivates each other. The link-up will launch the 1st of every month and will be open for two weeks. So add your monthly goals to the link-up below. I made the decision to move last month so as you can imagine I was a bit busy scrambling around getting everything turned in, that I blew off my goals and by the time I noticed there were only two more weeks left in April. I decided to try anyway because getting some goals started is better than not doing them at all. Here's how it turned out. 1. Make an official exercise plan & start working out. I realized that I wasn't ever going to sit down and make an exercise plan. It was just an excuse for me to procrastinate. So two weeks ago I decided to completely wing it. I woke up on Monday determined to walk that afternoon. I rallied up my niece's and nephew and we went walking 3 miles. They weren't happy to do it at first but after we were finished they were eager to do it again tomorrow. Now it's turned into a family bonding thing to get us out of the house. I couldn't figure out what to tap about. I found an article that said, "If you're unable to identify a problem to tap about just try tapping the pressure points while taking deep breaths." I've been doing that until a problem arises. I'm not entirely sure if it's helping but once I add it to a problem I'll let you guys know if it's effective. This week I managed to crank out 3 blog post including this post. I'd say getting back to the roots of why I started blogging and remembering why I love it was successful. I'm happy to be back blogging it's something I really missed now that the semester's slowing down hopefully I'll be here a lot more. I got around to this but there was no real luck finding anything different or new for LDR's. However, my boyfriend was determined to figure something out so he went and did his own research. He was luckier than me and actually found something. So last week Sunday for date night we played online video games together on pogo.com instead of the typical movie date night. It was actually fun. So I'm giving him credit for accomplishing this goal. Last months goals could've gone way better but I'm proud for an attempt to get to them even if there were only 2 weeks left. Hopefully, I'll be much more successful with my May goals. Since this month, I'll have a bit more free time on my hand. I decided to make most of my goals more blogging related. 1. Participate in a twitter chat at least once a week. It's been forever since I sat down and joined in on a twitter chat. They were always something fun to do. It was great talking to like-minded people or just hearing new thoughts and ideas. I want to start making them a weekly must. This blog is an important part of life even though it usually plays second fiddle when it comes to school work and family. I want to make space for blogging in my busy life. Therefore, I need to start making time to write. Of course, I'll be writing in the mornings right after exercises. It's the perfect time since I'm just waking up and my juices are flowing. A few bloggers convinced me Snapchat is a good social media to have for your blog but, I still haven't quite mastered it. It's supposed to be a day in the life or behind the scenes type thing. I'm still trying to figure out how to make it interesting and be consistent. I love Courtney from Courtney Little Things and Antonio from Living The Dream Snapchat stories. Courtney gives college-related advice on her Snapchat and actually records parts of her day. Antonio always has a video up and he gives life advice whether it be motivational or inspirational. I love checking out their stories throughout the day. You can follow their stories too if you're interested @courtneylthings & @lhathletics. This was one of the homework assignments from the book Radical-Self Love by Gala Darling which I reviewed on Wednesday. I can't accept a compliment to save the life of me. My boyfriend usually compliments me and my response is "You're just saying that" or "No I'm not." I know it's annoying for those trying to give me a compliment although they would never admit that. I need to start accepting compliments with a simple "Thank you." Along with accepting them I feel like I need to give more compliments especially to those I love. I believe May has a lot in store for me. I can't wait to get down to it. What do you have planned for this month? What were your April happenings? Don't forget to grab a post and link-up with Angela & I. We'd love to hear all about your goals for this month.